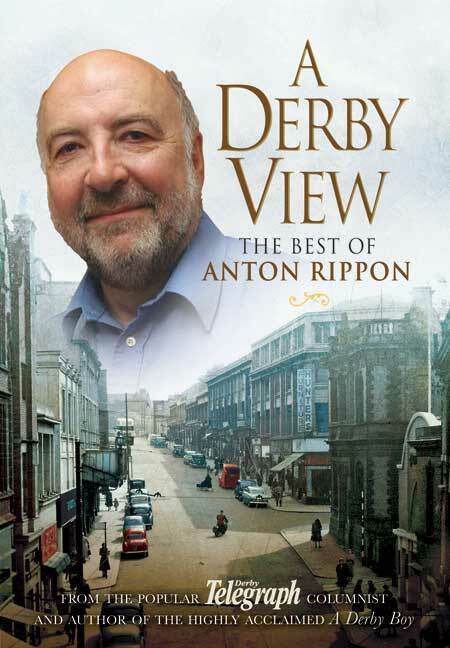 You'll be £12.99 closer to your next £10.00 credit when you purchase A Derby View- The Best of Anton Rippon. What's this? Anton Rippon is a Derby boy, born and bred. He is also one of the city's best-known writers and personalities, with a string of highly acclaimed books to his name. For the past eight years, he has written a popular weekly column in the Derby Telegraph in which he takes a whimsical, often sideways, look at life in Derby, both the serious side and the frivolous. In the process he captures perfectly the essence of this sturdy Midlands city. Sometimes commenting on current events, sometimes looking at the dafter side of life, often taking a trip down Memory Lane to illustrate a point, Anton has the rare ability to weave a story that both entertains and informs the people of his hometown. Now, in A Derby View, he has drawn together many of those columns, as well as new writing. The result is a book that will delight Derbeians young and old. Anton Rippon is an experienced journalist, author and publisher whose work has appeared in many publications including The Times, Independent, Sunday Telegraph and The Guardian. His many books include Gas Masks For Goal Posts: Football in Britain During the Second World War and Hitler’s Olympics: The Story of the 1936 Nazi Games which The Spectator described as ‘startlingly good and vividly illuminating’. Among his most recent books are A Derby Boy and Gunther Plüschow: Airman, Escaper, Explorer. He has also written documentary scripts for BBC Radio on subjects as diverse as football and the Second World War. Anton Rippon's book is very interesting in my opinion due to the fact that he includes points of view about numerous topics, such as food rationing, from a variety of people. By doing this, Rippon adds another side to what he is writing about in his articles. Also, the fact that he includes real life issues such as politics really connects to the readers by making them feel part of the discussion with their views because some will conflict with Rippon's point of view and some will agree with Rippon's point of view. The fact that Ripoon has included the past and the present in his articles by not only referring to them in his articles but also comparing the past to the present and how people in the present would cope with situations from the past, such as food rationing. I personally enjoyed this book due to the fact that Anton Rippon himself is from Derby and therefore is talking from first hand experiences of the area instead of a second less detailed view of Derby. As well as altering from the past and the present, Rippon also alters his tone of writing from humerous to serious depending on the topic and what point he is trying to get across to the reader which stops the book from being to boring and serious or too immature and that is why I enjoyed this book because of the contrasts that add to the overall effect of the stories in the book. Picking the best pieces from hundreds of columns written over an eight-year period was never going to be easy for Anton Ripper. But the fact that he had to be persuaded to put A Derby View together in the first place is a further measure of his modesty and a tribute to his appeal. Anton says: "When two old Bemrose School friends, Subrata Dasgupta, who logs on from Louisiana, and Ken Walker, from South Derbyshire, suggested I do this, I wasn't so sure. "But over the years, enough readers have been kind enough to write in to say that they were enjoying their weekly offerings. So I began to think it might be appreciated after all." Anton's columns have become a familiar part of the Telegraph each week after former editor Mike Norton gave him a chance to start writing them. Few aspects of Derby life are spared in Anton's observational pieces - including his horror at finding a pizza-munching youth sitting on a poppy wreath at Derby's war memorial. Or the more light-hearted look at his unsuccessful attempt to squeeze through a gap in a Darley Abbey fence to see Derby's infamous water buffalo, Oink. A stalwart Derby County fan, Anton takes several looks at the glory days and happily name-drops, mentioning Reg Harrison, Tommy Powell and Alan Durban - and how easy it was for fans to gain access to them. In "When Cloughie Ruined Durban's Egg Round" he rues the demise of the close fan-player relationship by comically concluding that in the future "it's unlikely any Rams supporter will be enjoying a chat with Lupoli by the trifle sponges in the Westfield Centre. "Or find Mart Poom cycling to the front door with a Sunday joint in the basket of his butcher's bike". Anton says: "When I sold my publishing company, Breedon Books, in 2003, I wanted to keep on working. "I originally started working on the Derby Telegraph in 1965 and spent 10 years in the Burton office before I left the paper, returning for a pell in 1981 in Derby. "I've always had a fondness for the Derby Telegraph, so I regard it as a privilege to be able to share my thoughts and experiences with Derbeians every week." Anton says he doesn't have any particular themes but adds that nothing or no-one is spared - including politicians, friends and family members. He says: "I hope that having them altogether in this book, they give a feel for life in my home town. "I've written for most of the quality nationals over the years but I am never more delighted than seeing my work in the Derby Telegraph. "I like a moan occasionally, but my motto in life has always been never to take myself seriously. Everyone should laugh at themselves. It makes the day more fun and hopefully that comes out in my columns.